In order for a plaintiff to bring a dramshop claim against a bar or restaurant alleging overservice leading to injury, he must satisfy the affidavit requirement of M.G.L. c. 231 §60J. The statute requires the plaintiff to set forth “sufficient facts to raise a legitimate question of liability appropriate for judicial inquiry.” Id. The statute was intended to help eliminate frivolous claims, thereby protecting bars and restaurants from aggressive litigation, and to encourage them to obtain liquor liability insurance. Unfortunately, the statutory language of 60J was not clear and became a nightmare for litigants. Defense counsel has argued an interpretation that effectively forecloses on the opportunity for injured parties, including innocent third parties damaged by another’s over intoxication and decision to get behind the wheel of a car, to obtain meaningful recovery for their harm. Defendants argue that the affidavit calls for facts submitted on personal knowledge and attested to by the plaintiff. Where a claim is brought by the estate of a deceased plaintiff, complying with the statute is impossible. On April 28, 2016, the SJC handed down its decision on the issue and provided great clarity. In Bayless v. TTS Trio Corporation, SJC-11958, the Court held that an affidavit based not on personal knowledge, but on information and belief, and signed by counsel satisfied the requirements of 60J. The holding permits the facts in the affidavit to be based on information uncovered from an investigation of the incident, as opposed to first-hand knowledge from individual witnesses. Information in the affidavit is verified by signature under oath, and, if signed and submitted by counsel, Rule 11. The Court found, contrary to the Defendant’s argument, that the “standard articulated in §60J is different from the standard a party must meet to succeed in a motion for summary judgment.” Bayless. This is significant, because the statute calls for the affidavit to be submitted within 90 days of filing the complaint, at which time little to no meaningful discovery would have been conducted in order to satisfy a summary judgment standard. The §60J affidavit “does not require plaintiffs to present evidence,” merely a good faith statement of facts discovered, at the early stage in litigation which supports asserting a valid dramshop claim. Id. The Court’s decision changes the landscape in which dramshop cases are presented and litigated. The decision clarifies the ambiguity litigants have muddled through in uncertainty. It is likely that defendant restaurants and bars will be more receptive to early resolution of cases with clear liability now that they cannot avoid liability by asserting a procedural deficiency. 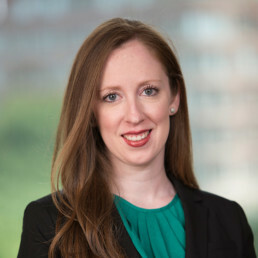 Erin K. Thurston is an associate with Jones Kelleher in the firm’s Boston office. Erin’s practice focuses on complex personal injury matters. In 2016, Erin was selected for inclusion as a “Rising Star” in the area of personal injury by Massachusetts Super Lawyers, the Thomson Reuters lawyer rating service.